The king, Math, is sent away on a pretext, and while he is gone the maiden who serves as his footholder is raped by his rivals. This invalidates her for the job, and to ease her shame Math marries her. But, he is still short a woman’s lap to rest his feet on. His brother, the magician Gwydion, suggests their sister Arianrhod for the footholder. Caer Arianhrod on the lower right; as you can see, it’s too low in the sky to be a circumpolar constellation. Do not, however, make the mistake of thinking that Arianrhod is a simple astral or lunar goddess. Her story is a complex one, and I will be covering various aspects of it over several posts. The Welsh Triads give Arianrhod a different family – she has a husband, Naf (or Llwas), the son of the sky-god Nwyfre, and two normal sons, Gwenwynwyn and Gwnar. Nwyfre means “firmament”, and he may be a sky and ancestor god to match the ancestral goddess Dôn, from whom both Gwydion and Arianrhod descend. Arianrhod has her own castle in the Mabinogion, called Caer Arianrhod, of course. Some have seen in this essentially female space – just the goddess and her serving-women, a different version of virginity, which comes up against the patriarchal, Christianized definition that Gwydion and Math accept. 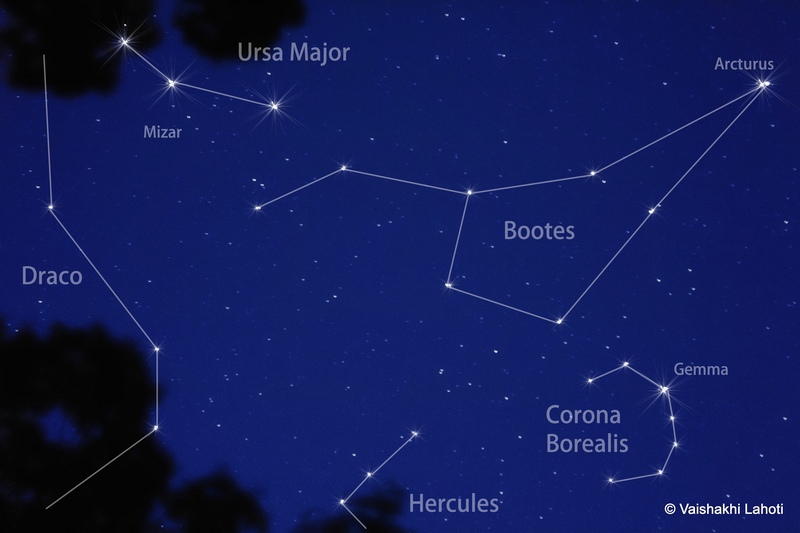 Of course, in Welsh the Northern Crown constellation or Corona Borealis is called Caer Arianhrod, so our goddess has a starry side, or at least a home in the stars. This has led some to see her as a star-goddess. Bayley (59) sees the silver wheel as a wheel of fate, with Arianrhod as the spinner of our lives. which many have taken as meaning that Caer Arianrhod is an afterworld, where the souls of the dead go either for good or to be reborn. (The poem seems to imply that Taliesin has lived many times, and seen many things.) This would suggest that, like Ceridwen with her cauldron, Arianrhod was a death/rebirth goddess. 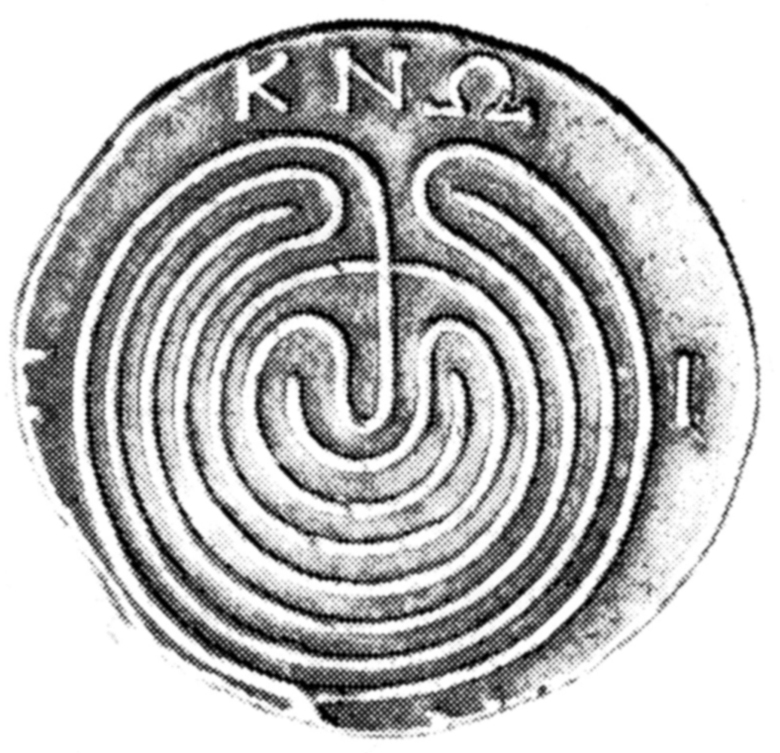 Coin from Knossos showing a unicursal labyrinth. Another goddess associated with the constellation is Ariadne, who helped Theseus beat the labyrinth at Knossos. 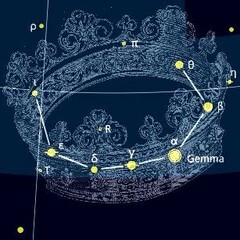 The jewelled crown he gave her was placed in the stars after her death. One name for the Minotaur was Asterion, “Starry”, so there may be some mythology involving the turns of the labyrinth and the motions of the stars that we have lost. The similarity between Ariadne’s thread (which let Theseus navigate the labyrinth) and Arachne’s web (both as weaver and spider) has led some to suggest that Ariadne was a weaver as well. It may be a reach to suggest that there’s any connection between the Greek and Welsh goddesses, but it is suggestive. Caer Arianrhod was part of a larger skyscape called Caer Sidi, which means either Zodiac Castle, or else Revolving Castle. Either suggests the sky, with the stars turning through the seasons. Zodiac Castle suggests the whole sky, but if it means Revolving it could be either the whole sky or the pole around which everything else turns. Is sweeter than the white wine the liquor therein. From what we can tell, Caer Sidi is meant to be one of those Celtic otherworlds where no one ages and everything is paradisiacal. These are usually in some unattainable place, off to the West (Tech Duinn) or hidden in the hollow hills. Some have tried to find a physical location for Caer Sidi, but the stars may be the ultimate in remote spots. Bayley, Michael 1997: Caer Sidhe vol 1: The Celtic Night Sky, Capall Bann. Jones, Gwyn and Thomas Jones (trans.) 1974: The Mabinogion, Penguin. Zeiser, Sarah E. 2008: ‘Performing a Literary Paternity Test: “Bonedd yr Arwyr” and the Fourth Branch of the “Mabinogi”‘, in The Harvard Celtic Colloquium, 28: 200-15. Hi there everyone, it’s my first visit at this website, and post is genuinely fruitful in support of me, keep up posting these posts. Thanks so much, glad to hear you’re finding it useful. Thanks so much, and good luck with your novel. This was a fascinating post. I like how you note the strangeness of Arianrhod’s story and how it complicates any attempt to find any quick answers from her lessons. I’ll be coming back to read more posts for sure. Glad you liked it! Arianrhod’s story is complex and strange – she’s definitely not a one-dimensional deity.